Godfrey, C. M., and C. J. Peterson, 2017: Estimating enhanced Fujita scale levels based on forest damage severity. Wea. Forecasting, 32, 243–252, doi:10.1175/WAF-D-16-0104.1. Cannon, J. B., J. Hepinstall-Cymerman, C. M. Godfrey, and C. J. Peterson, 2016: Landscape-Scale Patterns of Forest Tornado Damage in Mountainous Terrain. Landscape Ecol., 31, 2097–2114, doi:10.1007/s10980-016-0384-8. Godfrey, C. M., B. S. Barrett, and E. S. Godfrey, 2011: Severe Weather Field Experience: An undergraduate field course on career enhancement and severe convective storms. Journal of Geoscience Education., 59, 111–118, doi:10.5408/1.3604823. Godfrey, C. M., and D. J. Stensrud, 2010: An empirical latent heat flux parameterization for the Noah land surface model. J. Appl. Meteor. Climatol., 49, 1696–1713. Godfrey, C. M., and D. J. Stensrud, 2008: Soil temperature and moisture errors in operational Eta Model analyses. J. Hydrometeor., 9, 367–387. 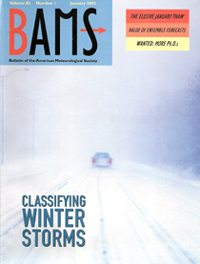 Godfrey, C. M., D. S. Wilks, and D. M. Schultz, 2002: Is the January thaw a statistical phantom? Bull. Amer. Meteor. Soc., 1, 53–62. Wilks, D. S., and C. M. Godfrey, 2002: Diagnostic verification of the IRI net assessment forecasts, 1997–2000. J. Climate, 15, 1369–1377. Duddu, V. R., S. S. Pulugurtha, A. S. Mane, C. M. Godfrey, M. D. Eastin, J. T. Radford, 2017: Increasing the Utilization of Weather Data for Safety Applications and Traveler Information. Report FHWA/NC/2016-13, North Carolina Department of Transportation, University of North Carolina at Charlotte, Charlotte, NC, 80 pp. Godfrey, C. M., 2015: Improved Climatic Data for Mechanistic-Empirical Pavement Design. Report FHWA/NC/2014-01, North Carolina Department of Transportation, University of North Carolina at Asheville, Asheville, NC, 117 pp. Godfrey, C. M., 2006: The influence of improved land surface and soil data on mesoscale model predictions. Ph.D. dissertation, University of Oklahoma, 128 pp. Godfrey, C. M., 2003: A scheme for correcting rainfall rates measured by a 2-D video disdrometer. M.S. thesis, School of Meteorology, University of Oklahoma, 116 pp. Peterson, C. J., J. B. Cannon, and C. M. Godfrey, 2015: First Steps Toward Defining the Wind Disturbance Regime in Central Hardwoods Forests. Natural Disturbances and Historic Range of Variation: Type, Frequency, Severity, and Post-disturbance Structure in Central Hardwood Forests USA, C. H. Greenberg and B. S. Collins, Eds., Springer, 89–122. Duddu, V., S. Pulugurtha, A. Mane, and C. M. Godfrey, 2019: Neural Networks to Predict Visibility: Application at Link-Level. Transportation Research Board 98th Annual Meeting, Washington, D.C., Transp. Res. Board, 19-03180. Peterson, C. J., C. M. Godfrey, F. T. Lombardo, and J. B. Cannon, 2016: Energy dissipation by tornadoes in heavily-forested landscapes. Preprints, 28th Conference on Severe Local Storms, Portland, OR, Amer. Meteor. Soc., 171. Godfrey, C. M., P. L. Wolf, M. K. Goldsbury, J. A. Caudill, and D. P. Wedig, 2011: An evaluation of convective warning utilization by the general public. Preprints, Conf. on Weather Warnings and Communication, Oklahoma City, OK, Amer. Meteor. Soc., 1.3. Godfrey, C. M., D. J. Stensrud, and L. M. Leslie, 2007: A new latent heat flux parameterization for land surface models. Preprints, 21st Conf. on Hydrology, San Antonio, TX, Amer. Meteor. Soc., CD-ROM, 6A.3. Godfrey, C. M., D. J. Stensrud, and L. M. Leslie, 2006: Soil temperature and moisture errors in Eta Model analyses. Preprints, 20th Conf. on Hydrology, Atlanta, GA, Amer. Meteor. Soc., CD-ROM, JP1.2. Godfrey, C. M., D. J. Stensrud, and L. M. Leslie, 2005: The influence of improved land surface and soil data on mesoscale model predictions. Preprints, 19th Conf. on Hydrology, San Diego, CA, Amer. Meteor. Soc., CD-ROM, 4.7. Stensrud, D., L. Leslie, J. Merchant, A. Taylor, C. Godfrey, and R. Bonifaz, 2004: Generation of improved land-surface data for high-resolution numerical weather	prediction models. Preprints, 16th Conference on Numerical Weather Prediction, Seattle, WA, Amer. Meteor. Soc., CD-ROM, P1.38. Wilks, D. S., and C. M. Godfrey, 2002: Diagnostic verification of the IRI net assessment forecasts, 1997–2000. Proc. 16th Conference on Probability and Statistics in the Atmospheric Sciences, Orlando, FL, Amer. Meteor. Soc., 31–36. Godfrey, C. M., and D. S. Wilks, 2000: The "January thaw" is a statistical phantom. Proc. 12th Conference on Applied Climatology, Asheville, NC, Amer. Meteor. Soc., 127–130. Wilks, D. S., and C. M. Godfrey, 2000: Diagnostic verification of the IRI net assessment forecasts, 1997–1999. Proc. 25th Annual Climate Diagnostics and Prediction Workshop, Palisades, NY, NOAA Climate Prediction Center, 153–156.